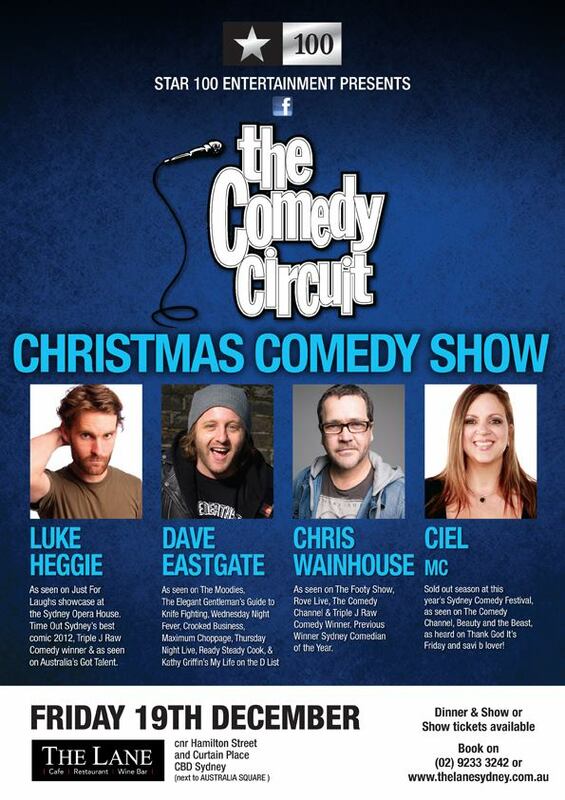 Very excited to get into the silly season with some laughs at The Comedy Circuit: Christmas Comedy Show at The Lane in Sydney’s CBD on Friday 19th December,2014. Some amazing performers are on the bill and this is a show that cannot be missed! Four brilliant comedians will take to the stage with a comedy style to suit everyone’s tastes. This is the gift that will keep on giving this Christmas with dinner, a show and a whole lot of laughs waiting for you. The MC for the evening is the spectacular Ciel. With her versatile and engaging comedy styling’s, Ciel has enjoyed a career in radio presenting, TV appearances and writing for programs such “Australia’s Funniest Home Videos”. Dave Eastgate is a rock star on the stage with his outrageous, energetic and highly entertaining brand of comedy. Known to get very up close and personal with his audience, Dave is not one to miss. Luke Heggie’s no-nonsense one-liners delivered in a dry, deadpan manner have garnered praise in Australia and abroad. His quick rise to notoriety on the Australian comedy scene came after the Raw Comedy Win in 2010. Also winner of Sydney’s Best Comic 2012 Time out Magazine, Luke was a must for our Christmas Comedy Show. Sharp witted and daringly clever, Chris Wainhouse is the perfect headline for a Comedy Christmas show you’ll never forget! Chris is a regular headline act at some of the world’s most prestigious comedy venues including Melbourne’s Comedy Club, ”The Classic” in Auckland and Jongluers in the UK. Sydney, get ready, it’s our turn next! You can learn more at the Facebook event: https://www.facebook.com/events/1540287749544637/?fref=ts Make sure to book as tickets will sell out! Venue: The Lane, Restaurant & Wine Bar. Cnr Hamilton Street and Curtain Place, CBD Sydney, 2000.